Victoria Moon Erickson, a 31 year old chef traveling the country food blogging about vegan cuisine and healthier lifestyles, has been missing since January 21, 2013 when she disappeared in Houston, TX. 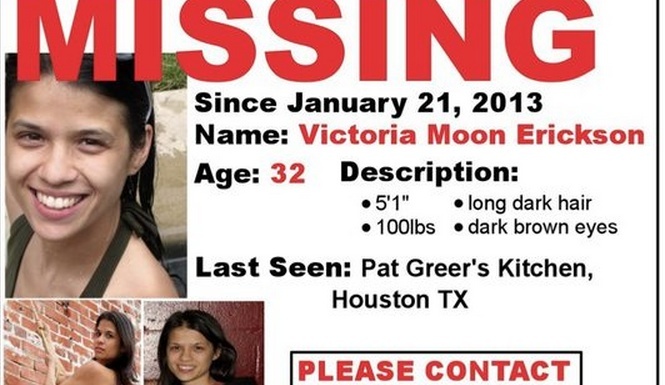 Victoria Moon Erickson arrived in Houston on Jan. 16 and was staying at Pat Greer’s Kitchen on West Clay. Erickson, an Atlanta, GA native, had been chronicling on her blog a cross country road trip to vegan kitchens across the nation, as well as her quest to find her long-lost brother. Erickson’s blog posts stopped last week after she apparently disappeared. Erickson’s personal effects, including her dog, car, computer, cell phone and ID, were all found still at the restaurant she had been staying at. Erickson, an Atlanta, Ga. native, had been chronicling a cross-country road trip to vegan kitchens across the nation, as well as her quest to find her long-lost brother, CBS Atlanta reports. Her blog posts stopped last week after she apparently disappeared. Erickson was last seen Monday, Jan. 21 at Pat Greer’s Kitchen, a vegan kitchen in Houston, Texas. This is where she had been working and staying, according to CBS Atlanta. KHOU reports Erickson arrived in Houston on Jan. 16. Erickson reportedly left her dog, car, computer, cell phone and ID at Greer’s and has not been seen since, according to KHOU. Rosa Fitch, Erickson’s close friend, told CBS Atlanta she is concerned that Erickson abandoned her life.